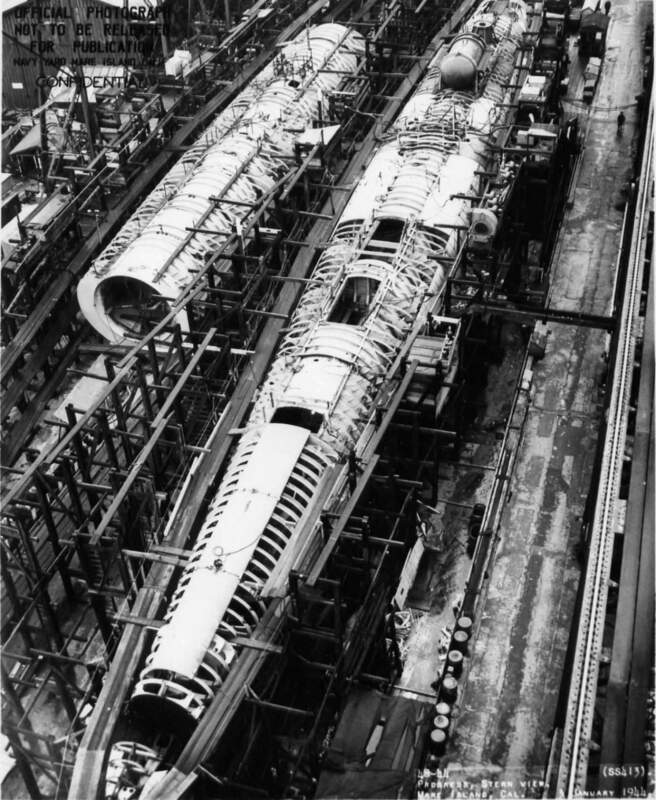 Balao Class Submarine: Laid down, 24 August 1943, at Mare Island Navy Yard, Vallejo, CA. 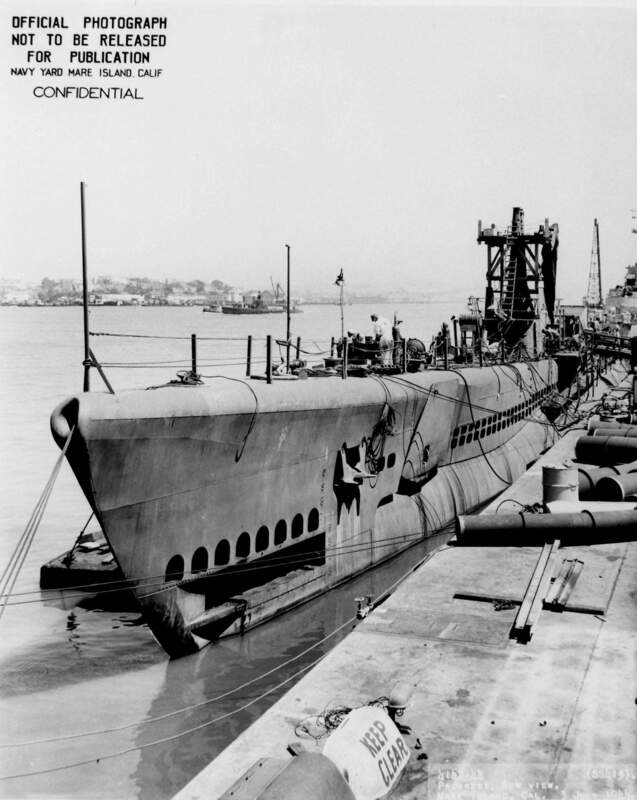 ; Launched, 19 May 1944; Commissioned USS Spot (SS-413), 3 August 1944; Decommissioned, 19 June 1946, at Mare Island Navy Yard; Laid up in the Pacific Reserve Fleet, Mare Island Group; Recommissioned, 19 August 1961, at Pearl Harbor, HI. 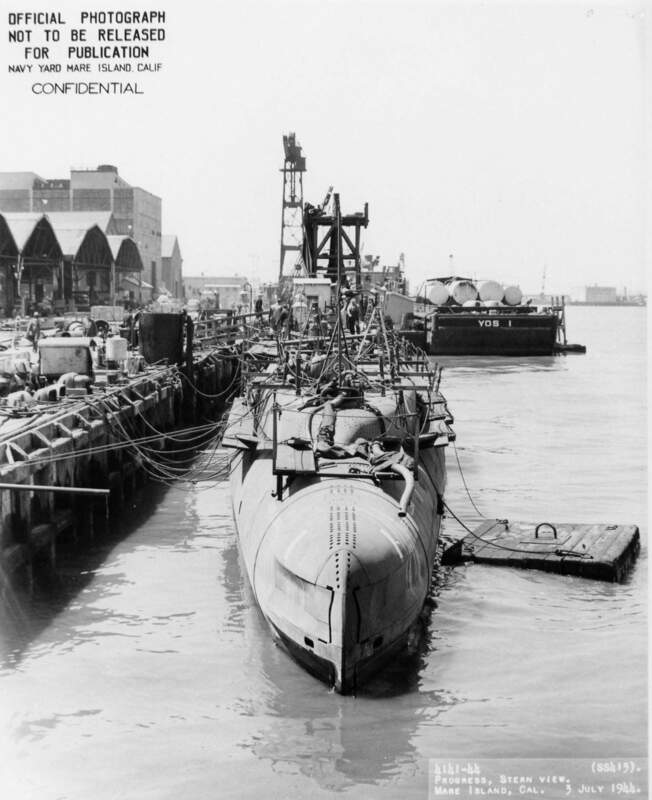 ; Decommissioned, and transferred (loaned) to Chile, 12 January 1962, under terms of the Military Assistance Program, renamed Simpson (SS-21); Sold outright to Chile, 1 August 1975 and Struck from the Naval Register; Final Disposition, deleted by the Chilean navy in 1982, fate unknown. Spot earned four battle stars for World War II service. Specifications: Displacement, Surfaced 1,526 t., Submerged 2,391 t.; Length 311' 8"; Beam 27' 3"; Draft 15' 3"; Speed, Surfaced 20.25 kts, Submerged 8.75 kts; Cruising Range, 11,000 miles surfaced at 10 kts; Submerged Endurance, 48 hours at 2 kts; Operating Depth, 400 ft; Complement 6 Officers 60 Enlisted; Armament, ten 21" torpedo tubes, six forward, four aft, 24 torpedoes, one 5"/25 deck gun, one single 40mm gun mount, one single 20mm gun mount, two .50 cal. machine guns; Patrol Endurance 75 days; Propulsion, diesel-electric reduction gear, Fairbanks Morse diesel engines, 5,400 HP, Fuel Capacity, 116,000 gal., four Elliot Motor Co. electric main motors with 2,740 shp, two 126-cell main storage batteries, two propellers. 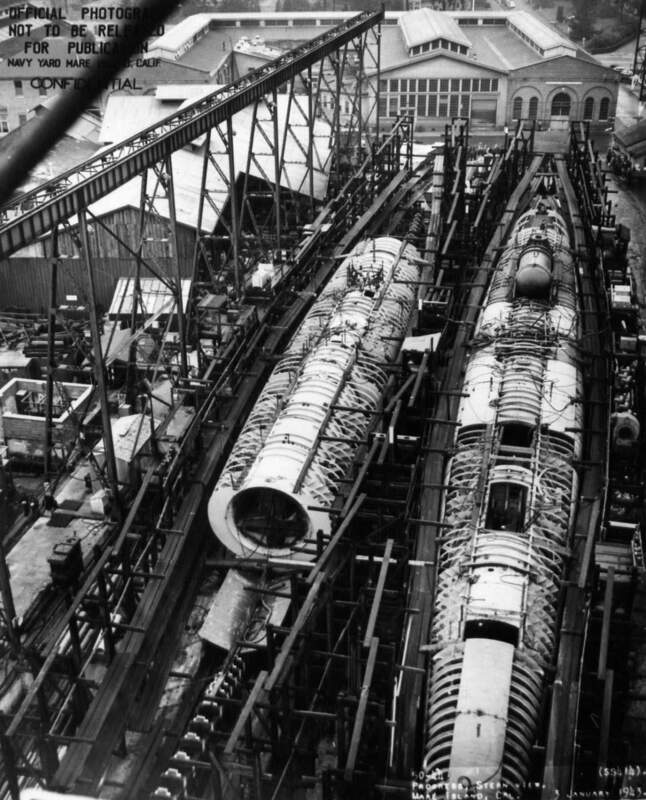 214k Honorary welders for the keel laying of the Spot (SS-413) are shown at Mare Island on 24 August 1943. Left to right: Mr. C. R. Campbell (Quarterman Boilermaker) and Mr. George I. Lyon (Quarterman Blacksmith). USN photo # 6090-43, courtesy of Darryl L. Baker. 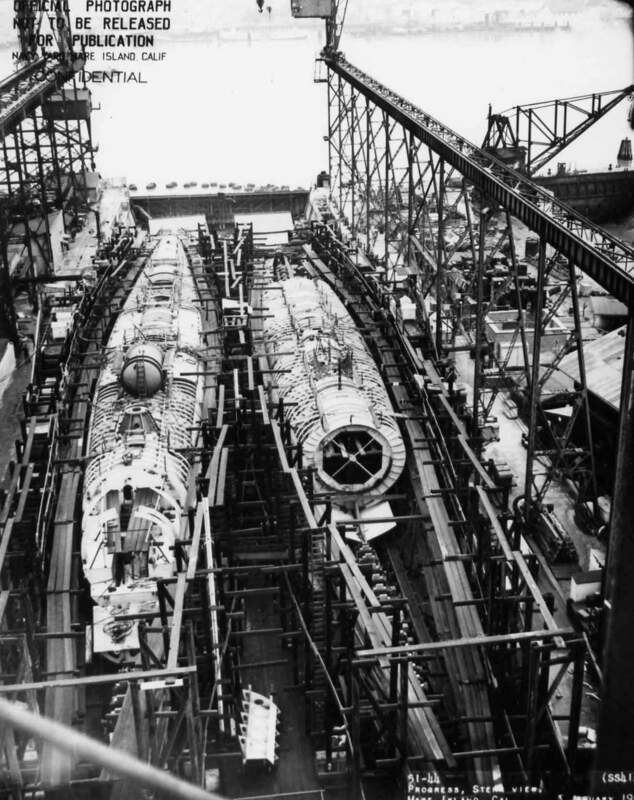 317k Stern view of the Springer (SS-414) on the building ways at Mare Island on 3 January 1944. The Spot (SS-413) is to the right. USN photo # 50-44, courtesy of Darryl L. Baker. 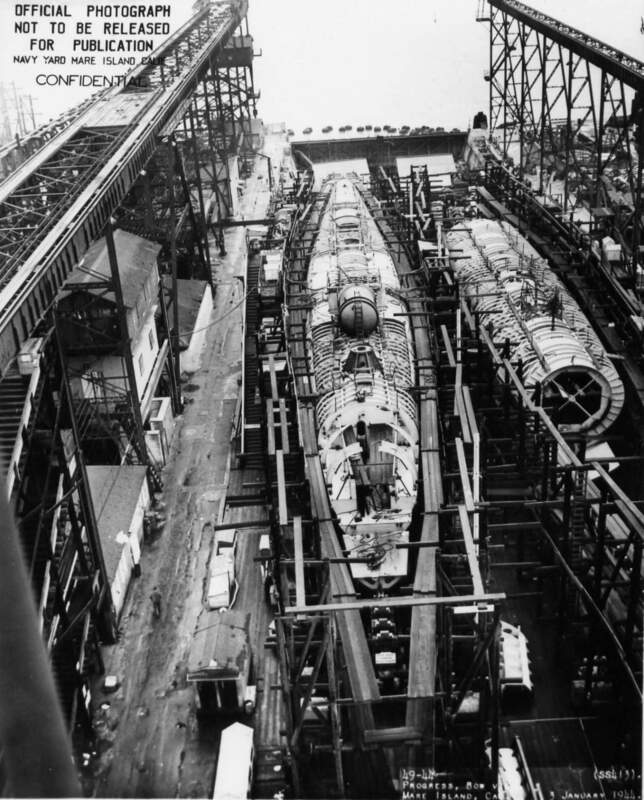 302k Bow view of the Springer (SS-414) on the building ways at Mare Island on 3 January 1944. 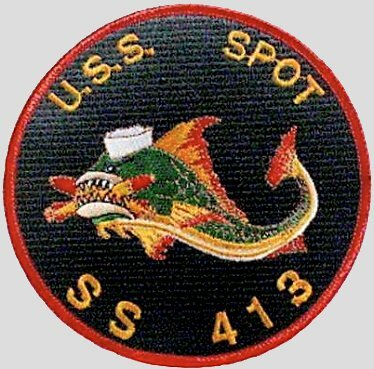 The Spot (SS-413) is to the left. USN photo # 49-44, courtesy of Darryl L. Baker. 319k Stern view of the Spot (SS-413) on the building ways at Mare Island on 3 January 1944. The Springer (SS-414) is to the left. USN photo # 48-44, courtesy of Darryl L. Baker. 230k Progress, stern view of the Spot (SS-413) on the building ways at Mare Island on 3 January 1944. The Springer (SS-414) is to the right. USN photo # 51-44, courtesy of Darryl L. Baker. 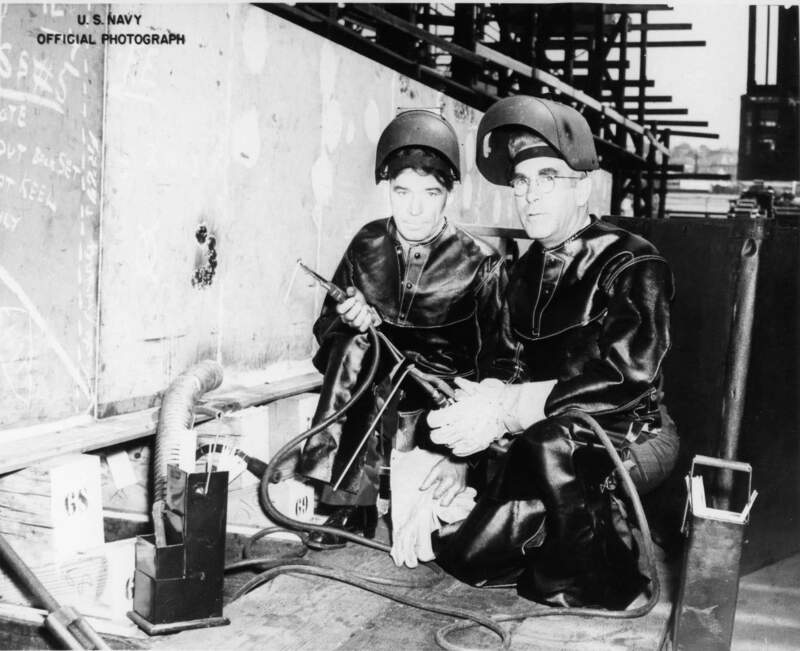 175k Mrs. Adolph G. Gieselmann (Sponsor) left and Miss Jean Gieselmann (Maid of Honor) right are shown prior to the launching of Spot (SS-413) at Mare Island Navy Yard on 19 May 1944. USN photo # 2988-44, courtesy of Darryl L. Baker. 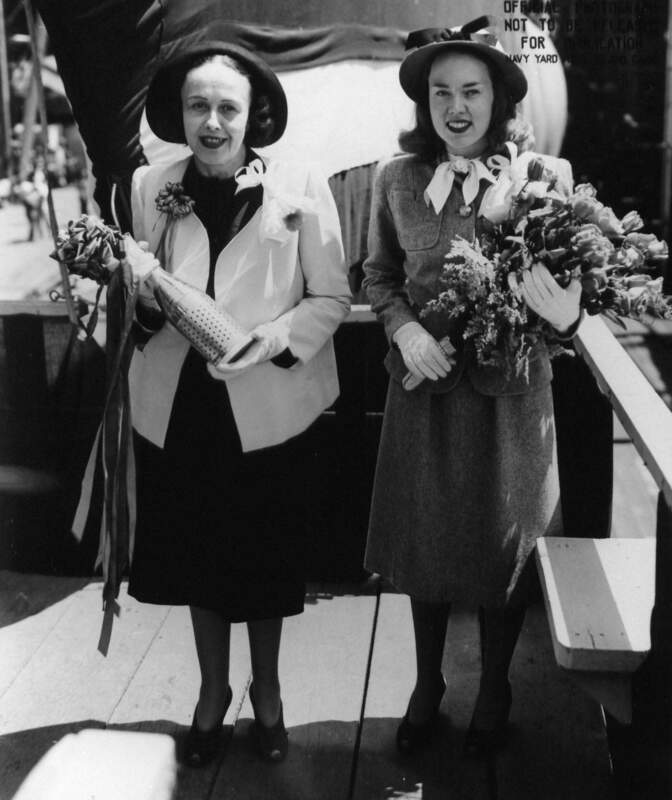 770k Mrs. Adolph G. Gieselmann (Sponsor), & party at launching. Half way down ways. USN photo # 80-G-448212 from National Archives and Records Administration (NARA), College Park, Maryland, courtesy of Sean Hert. 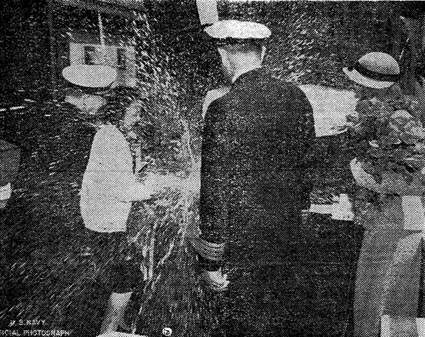 44k Photo of the christening of Spot (SS-413) at Mare Island on 19 May 1944 from the 26 May 1944 edition of the shipyard newspaper "The Grapevine". USN photo courtesy of Darryl L. Baker. 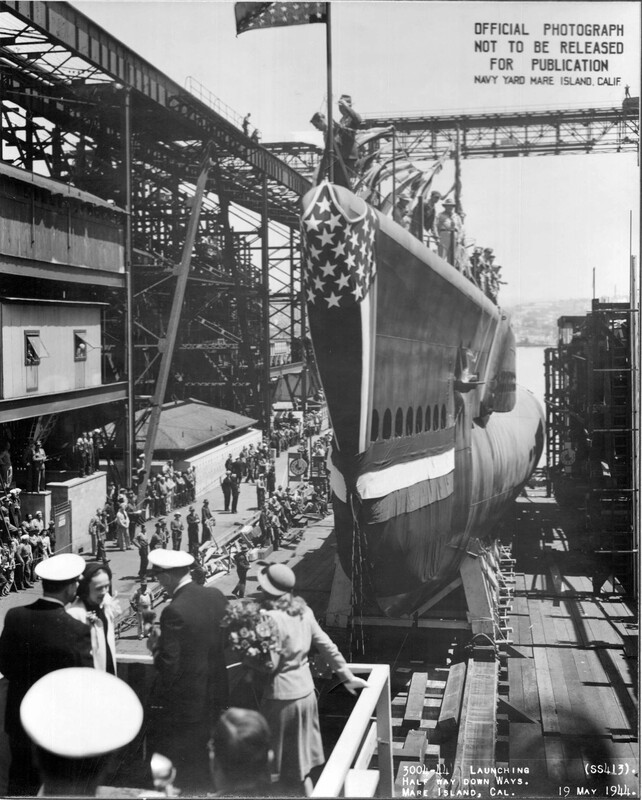 176k Distinguished guests at the launching of the Spot (SS-413) at Mare Island are shown just after the submarine's launching at Mare Island on 19 May 1944. 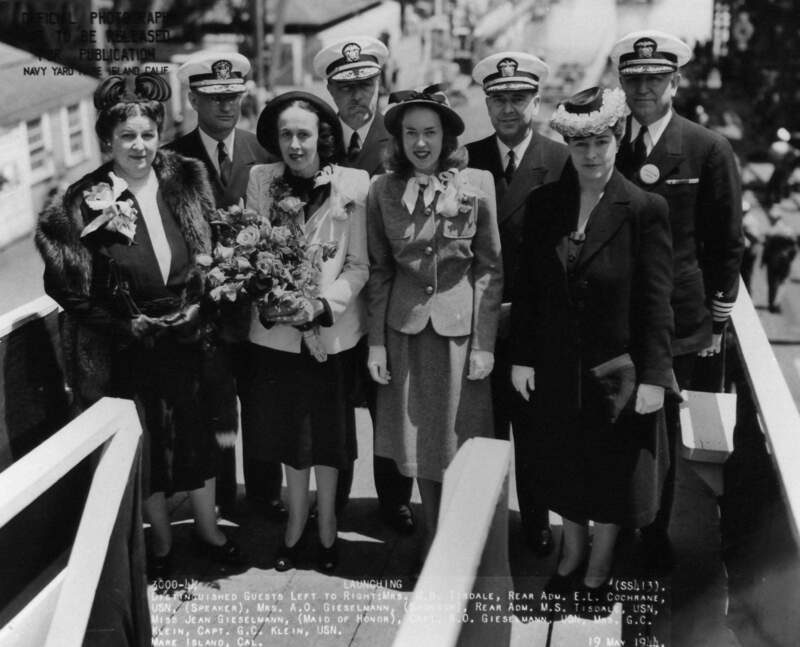 Left to right: Mrs. M. S. Tisdale, RADM E. L. Cochrane (Speaker), Mrs. Adolph G. Gieselmann (Sponsor), RADM M. S. Tisdale, Miss Jean Gieselmann (Maid of Honor), Capt. A. O. Gieselmann, Mrs. G. C. Klein, and Capt. G. C. Klein. USN photo # 3000-44, courtesy of Darryl L. Baker. 183k Stern view of the Spot (SS-413) at her outfitting berth at Mare Island on 3 July 1944. The Oil Storage Barge YOS-1, is off to her right. USN photo # 4141-44, courtesy of Darryl L. Baker. 199k Bow view of the Spot (SS-413) at her outfitting berth at Mare Island on 3 July 1944. 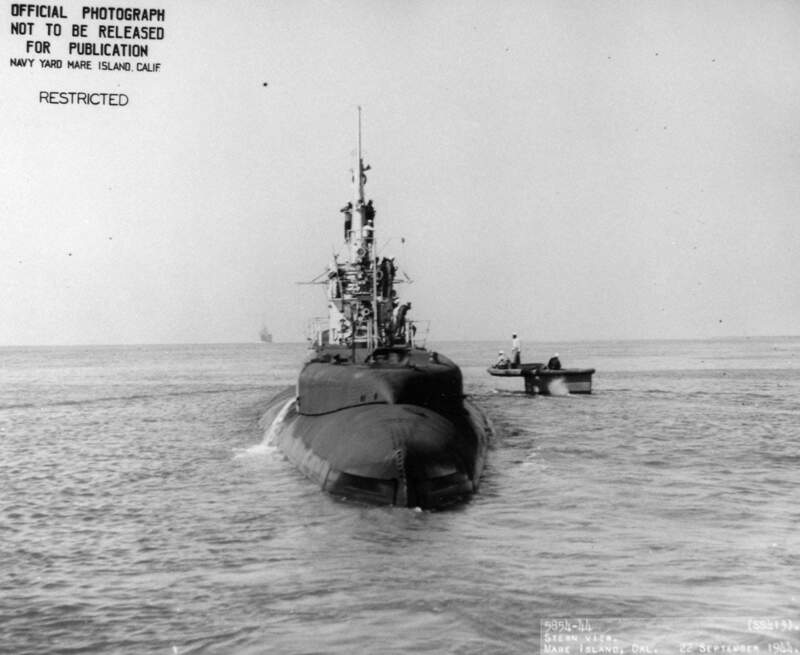 The Trepang (SS-412) is in the background returning from bay trials. USN photo # 4142-44, courtesy of Darryl L. Baker. 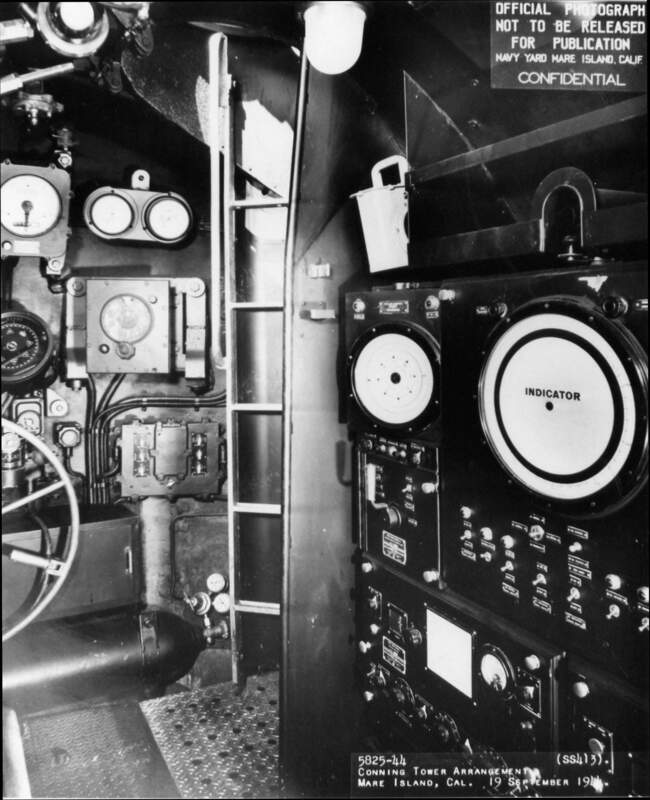 243k Conning tower arrangement looking forward aboard Spot (SS-413) at Mare Island on 19 September 1944. USN photo # 5825-44, courtesy of Darryl L. Baker. 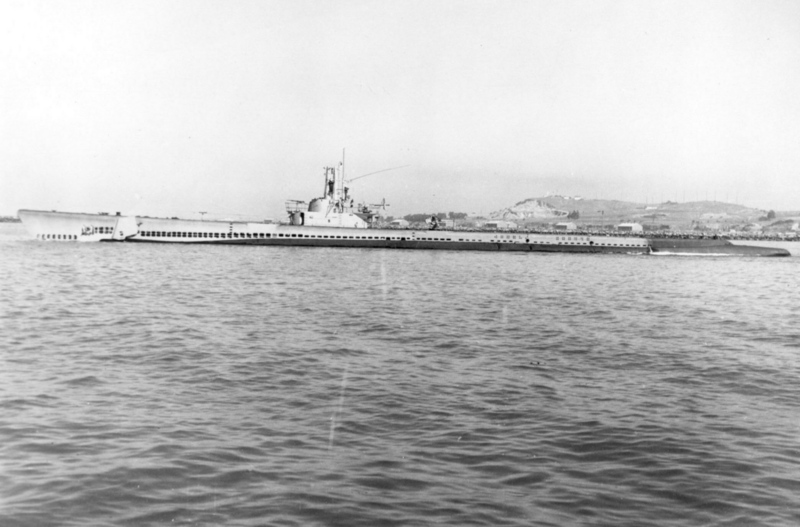 195k Bow on view of Spot (SS-413) off Mare Island on 22 September 1944. USN photo # 5849-44, courtesy of Darryl L. Baker. 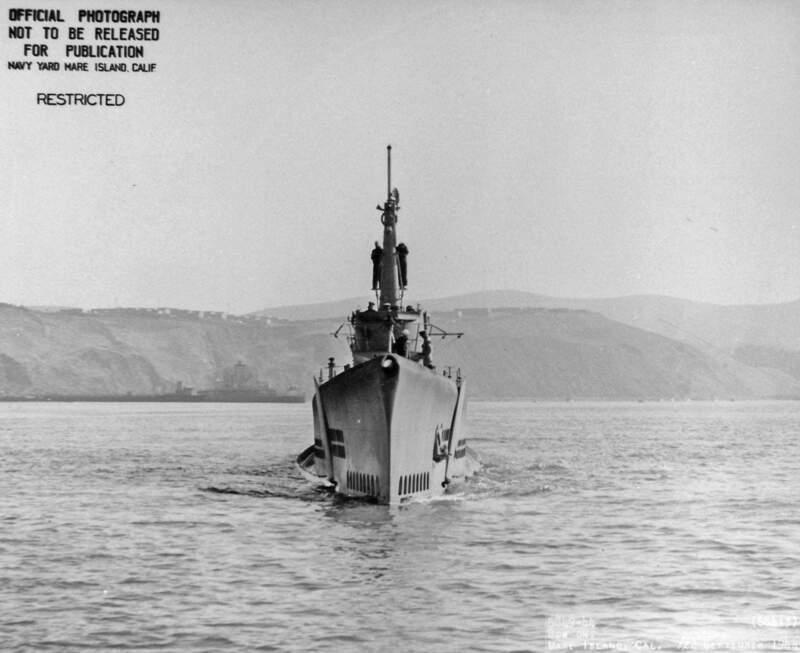 217k Stern view of Spot (SS-413) off Mare Island on 22 September 1944. Note the accompanying motorboat. USN photo # 5854-44, courtesy of Darryl L. Baker. 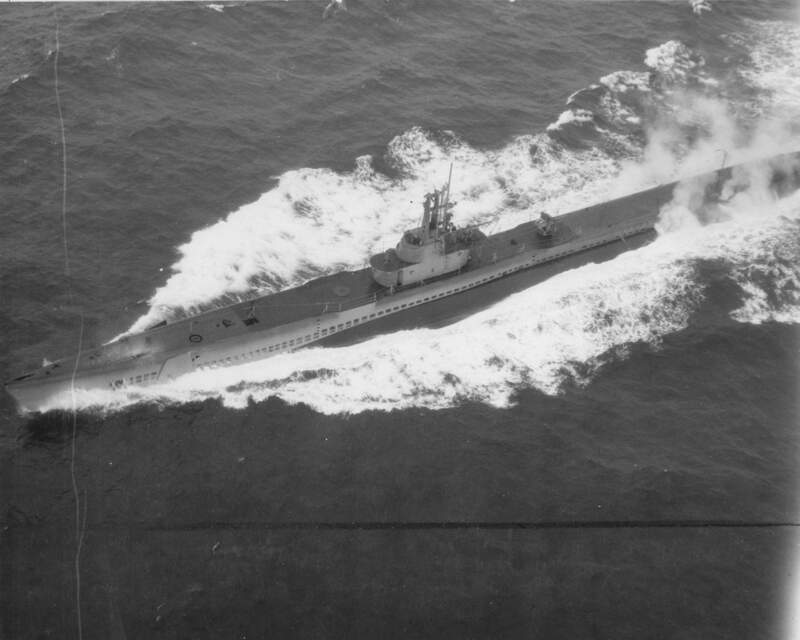 704k Spot (SS-413) spotted at 200 feet, 24 September 1944. USN photo # 80-G 280629 from NARA, College Park, Maryland, courtesy of Sean Hert. 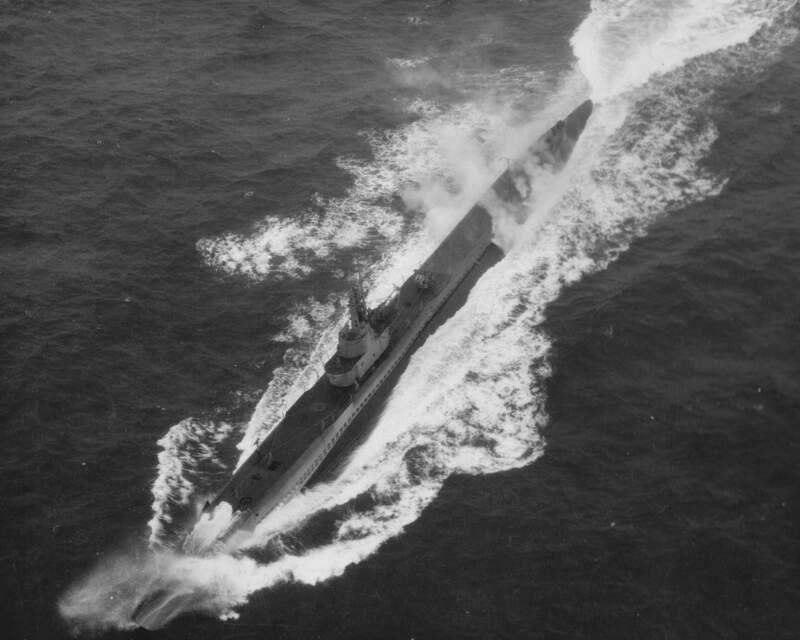 880k Spot (SS-413) in the ocean at 200 feet, 24 September 1944. USN photo # 80-G 280630 from NARA, College Park, Maryland, courtesy of Sean Hert. 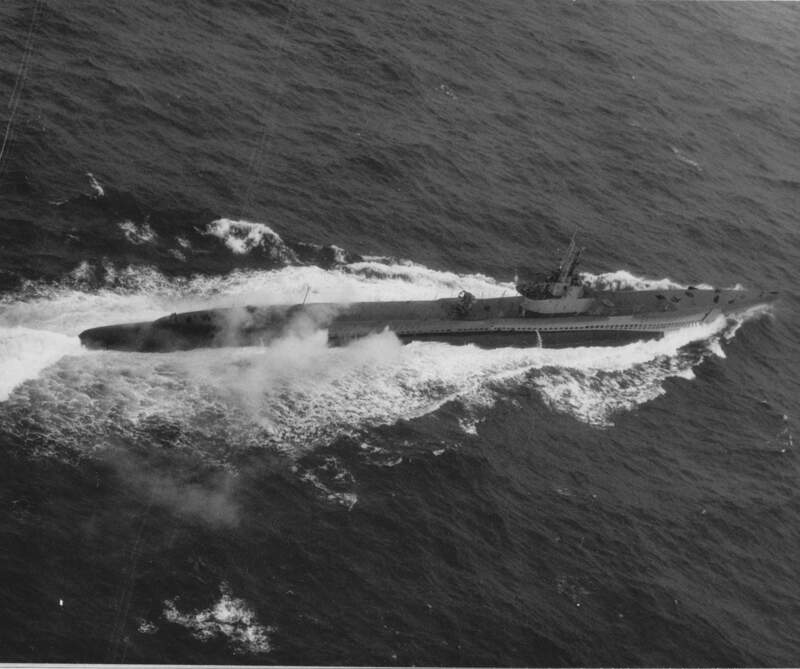 714k Spot (SS-413) the submarine at 200 feet, 24 September 1944. USN photo # 80-G 280631 from NARA, College Park, Maryland, courtesy of Sean Hert. 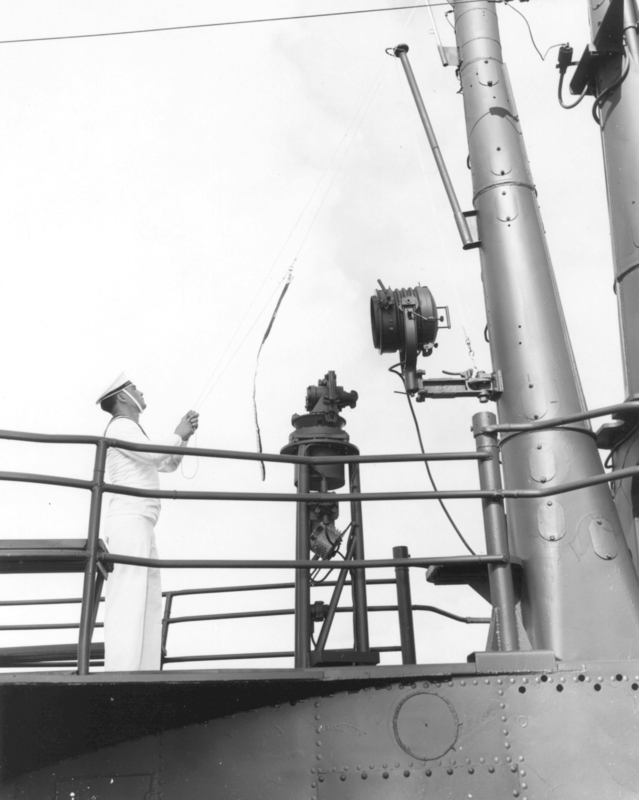 230k Spot's (SS-413) spotters & sailors seeking sails search skyward, suspended, swiveling, standing, sitting & soaked in spray while seated in the submarine's shears in salty swirling seas surrounding southern Saipan, March 45. These photographs were taken by my father, Paul D. Guttman, who was then serving in the U.S. Navy motion picture combat cameraman, with the rank (at that time) of Photographers Mate 3/C. 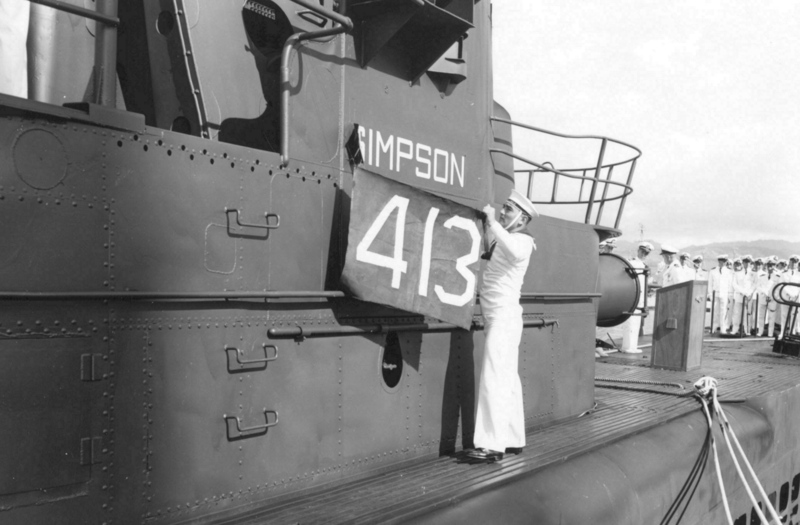 His assignment to the Spot (SS-413) came about through a request by Admiral Lockwood, to Admiral Nimitz, that the Navy film a war patrol for the production of a documentary on the submarine campaign. A film of that sort had recently been released about carrier operations, entitled The Fighting Lady, parts of which my father had photographed. The Fighting Lady had been so well received (it got an Academy Award) that Admiral Lockwood requested that the Navy make a similar film aboard one of his Submarines. 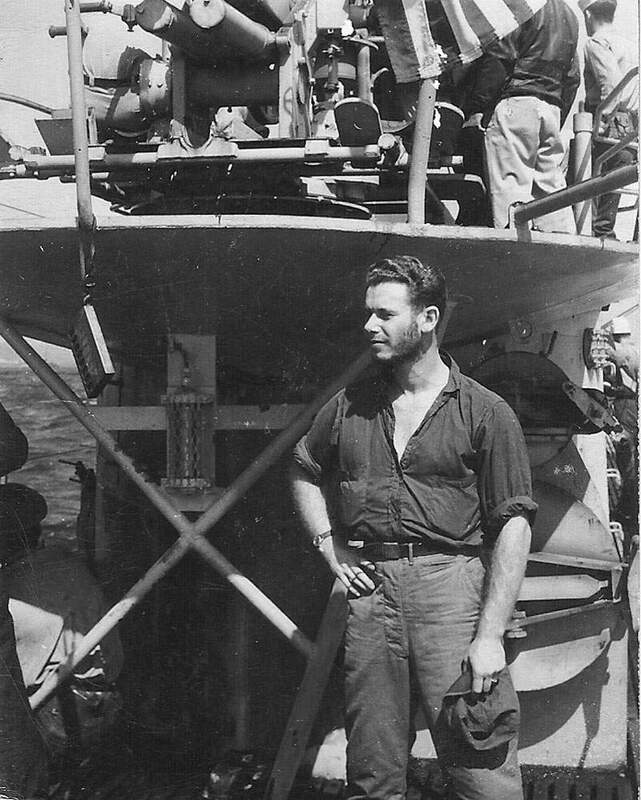 My father, who had already participated in several dangerous combat assignments, volunteered to accompany one of the submarines on a war patrol to ascertain the feasibility of filming on board under actual combat conditions. 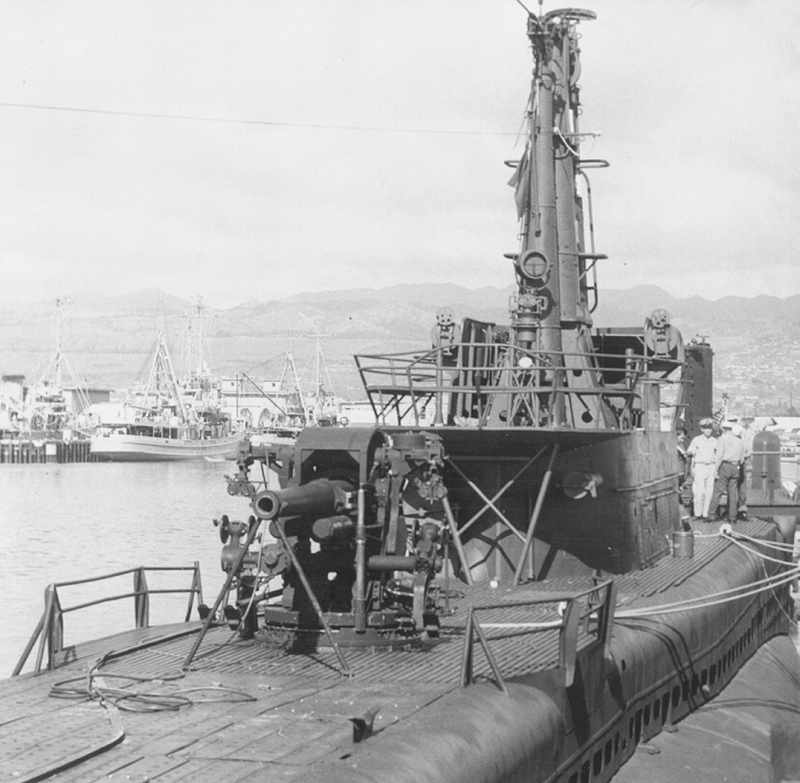 The submarine selected was the Spot, which he joined and left at Saipan. Filming aboard a submarine in combat turned out to be a great deal more difficult than filming aboard an aircraft carrier. The interior was cramped and relatively dark, and the control room was often illuminated with red lights. There simply wasn't sufficient light to film using the sort of color film available in those days and, needless to say, additional lighting was out of the question. As for filming on deck while surfaced, that was equally out of the question. The submarine had to be ready to submerge at a moments notice at all times. 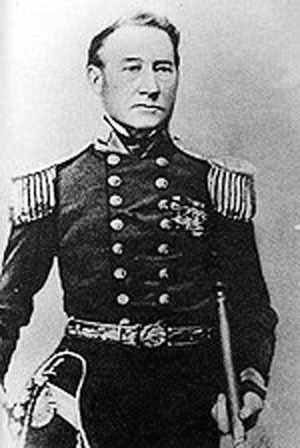 Consequently the commander, William Post, would not allow any extraneous personnel on deck, which naturally meant my father. It was a very eventful patrol. On March 31st, Spot sighted a destroyer that offered no recognition signals. The submarine maneuvered to close when the destroyer turned towards her and increased its speed. When the range was approximately 5,500 yards, the destroyer opened fire. 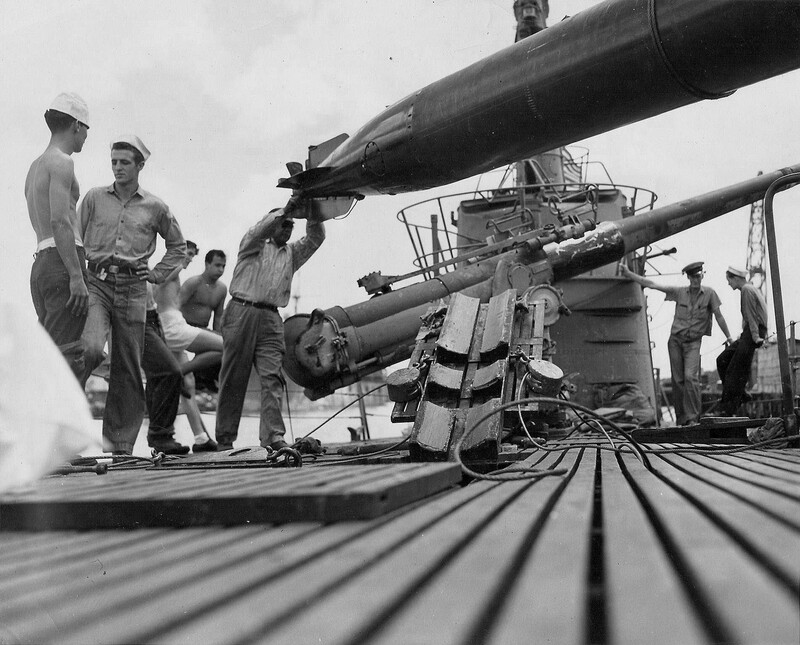 Spot fired a recognition flare that was answered by a second salvo. As Spot submerged, another salvo straddled her conning tower. The destroyer was later identified as Case (DD-370). Spot suffered no damage in this incident which could have been a disaster. However, in the end all my father had to show for his experience were a few still pictures, including submariners load torpedoes into Spot. 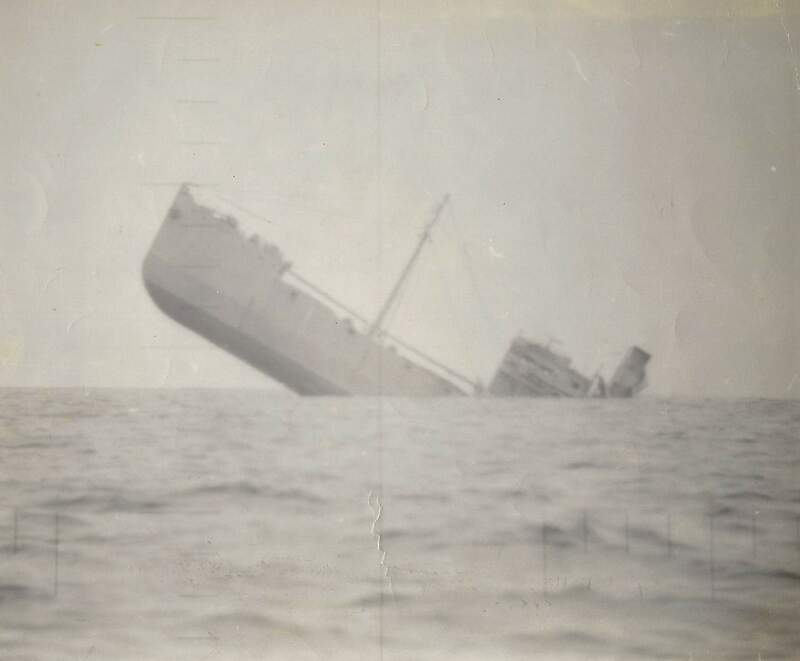 Commander Post did allow him to photograph the sinking of passenger-cargo Nanking Maru through the periscope, which was the only actual combat shot he managed to get during the course of the entire voyage, but even that image he was only able to get with his black-and-white still camera. At the end of the patrol my father left the Submarine at Saipan, where he was assigned to accompany several bombing missions over Japan, and became one of the few Navy personnel to have flown combat missions in Army Air Force B-29s. 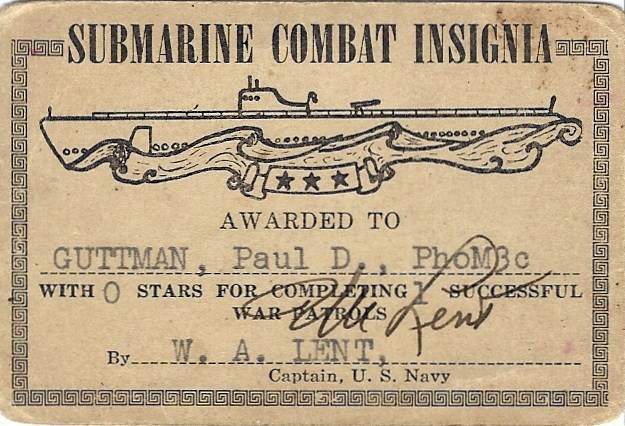 He was awarded the Submarine Combat Pin for his patrol on the Spot, which was a rare distinction because he was actually a Seabee and not Submariner. In fact, he was probably the only Seabee ever to have been awarded the both the Submarine Combat Pin and the Distinguished Flying Cross. Incidentally, My father always considered the submariners on the Spot to have been the bravest men he ever knew. Coming from a man who experienced combat in carrier planes and B-29s, and who landed with the Marines on islands such as Saipan, Peleliu and Iwo Jima, that's really saying something! When I was small he owned a sailboat. He could well have named it after the Yorktown (CV-10) or the Hornet (CV-12) or any of the other warships he served on, but he deliberately chose to name it "Spot". I thought it an odd name at the time. It wasn't until long afterwards that I learned the significance of the name. Partial text courtesy of DANFS. USN photo by Paul D. Guttman, courtesy of Robert Guttman. 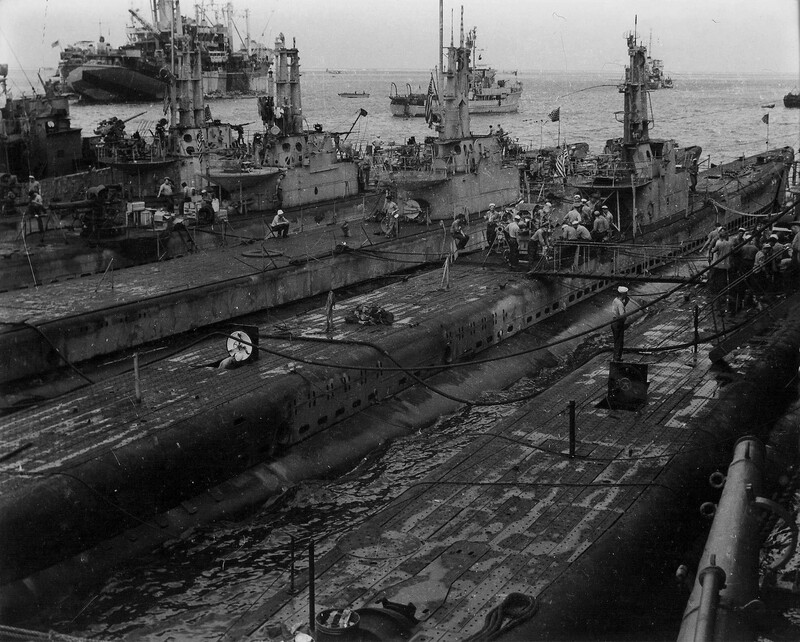 524k Spot (SS-413), Sea Fox (SS-402) & Queenfish (SS-393) & friends at Saipan, March 1945. USN photo by Paul D. Guttman, courtesy of Robert Guttman. Lizardfish(SS-373), late 1945 - early 46. Courtesy of John Hummel, USN (Retired). 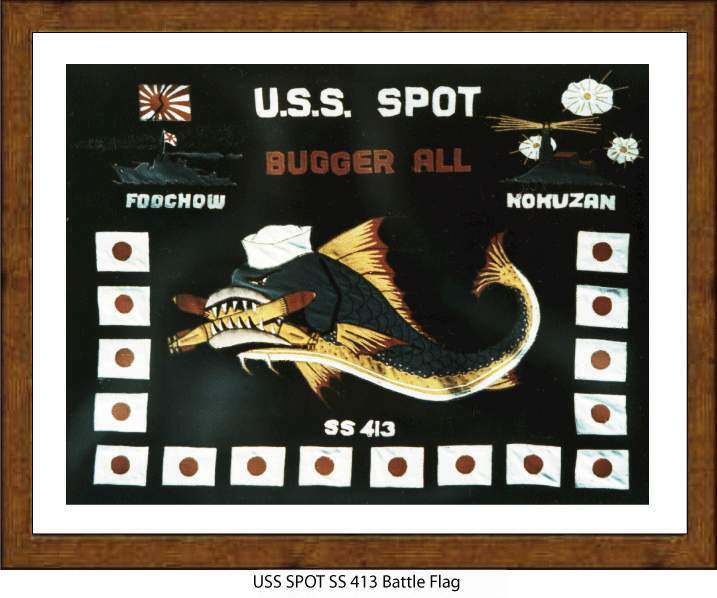 53k WW II battle-flag of the Spot (SS-413). Courtesy of Jack Treutle (of blessed memory). 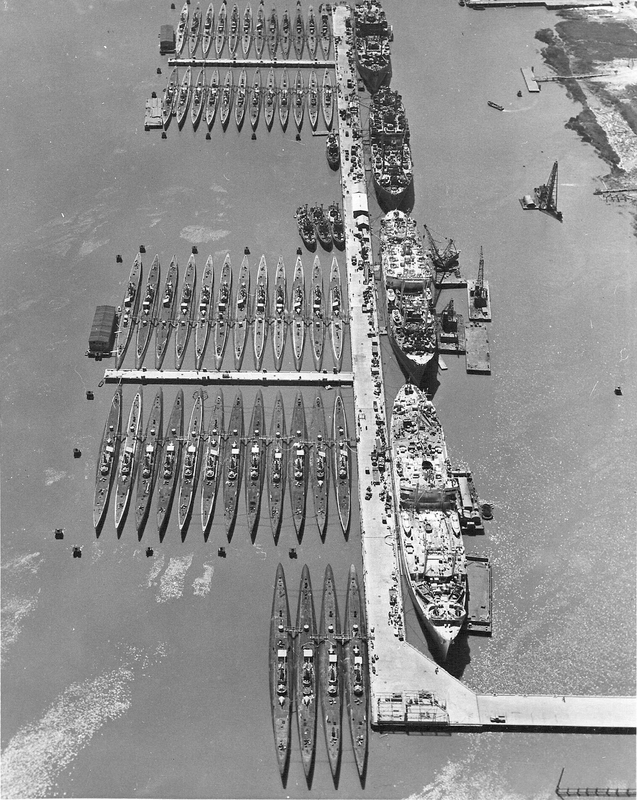 137k Reserve fleet at Mare Island, circa January 1946. There are 52 submarines and 4 Sub Tenders in this photo. This photo is a Berthing list identifying the ships in the picture. 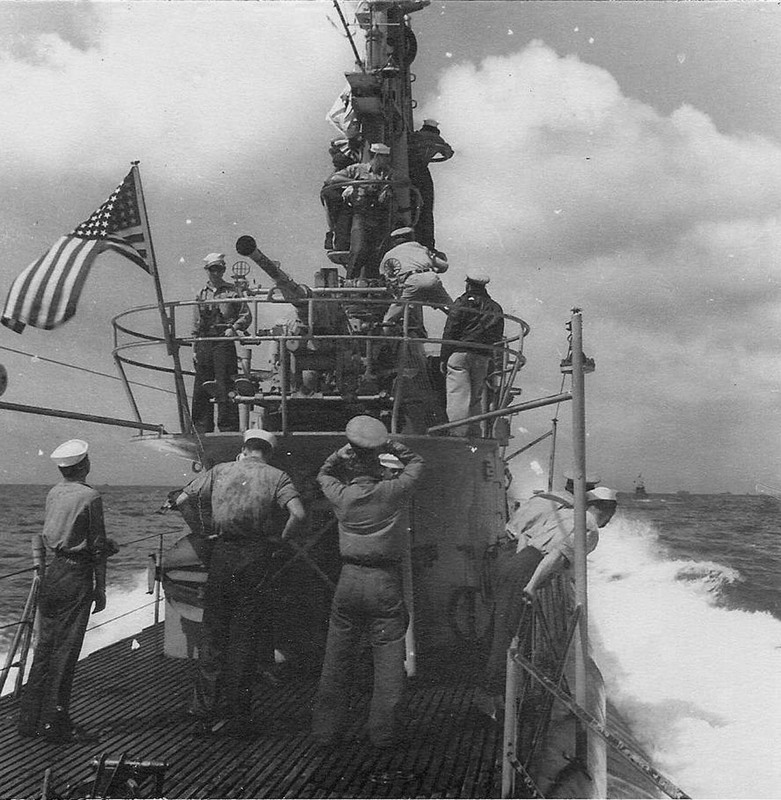 Photo commemorating 50 years, U. S. Submarine Veterans of WW II 1996 calendar, courtesy of Darryl L. Baker. 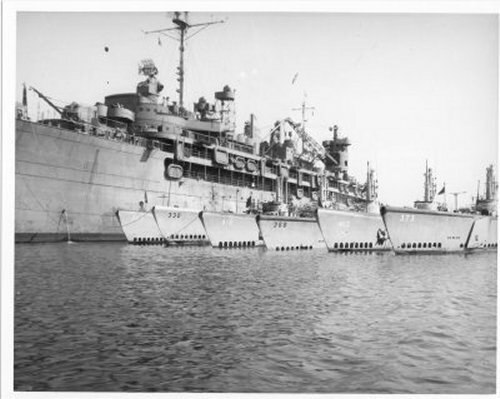 453k Photo of the Reserve fleet at Mare Island, circa January 1946. There are 52 submarines and 4 Sub Tenders in this photo. Whether coincidental or on purpose, the number of boats in the photo is the same as that which were lost in WW II. Photo commemorating 50 years, U. S. Submarine Veterans of WW II 1996 calendar, courtesy of Darryl L. Baker. 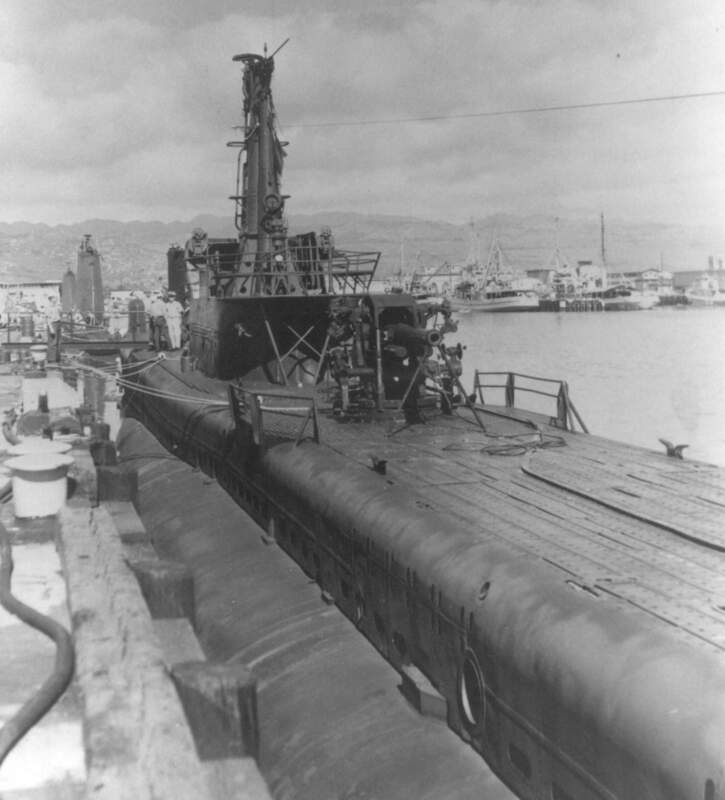 227k The Icefish (SS-367) in the Mare Island Reserve Fleet on 13 October 1948. 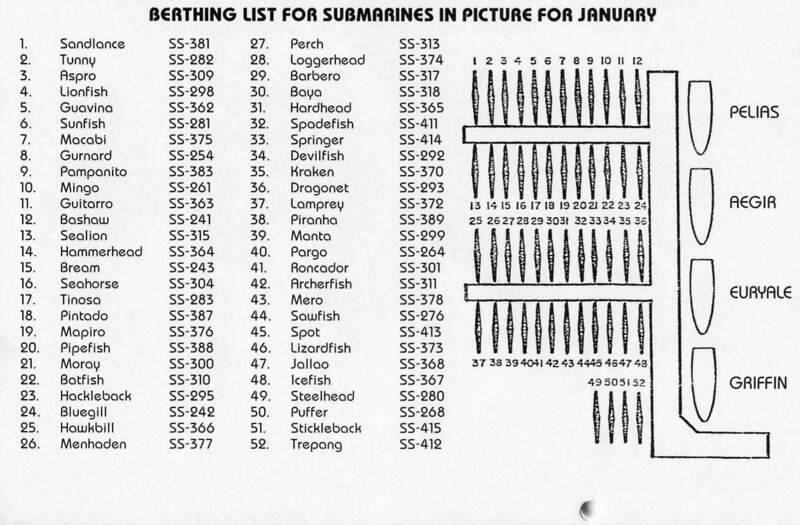 The other subs outboard of Icefish are Jallao (SS-368), Trepang (SS-412), Spot (SS-413) and Stickleback (SS-415). USN photo # 1916-10-48, courtesy of Darryl L. Baker. 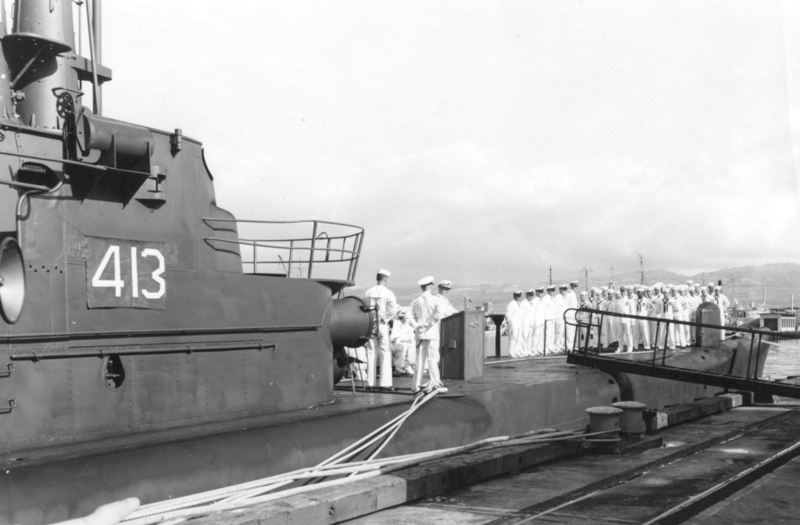 752k In January 1961, Spot (SS-413) was towed to Pearl Harbor for modernization in preparation for transfer to Chile. 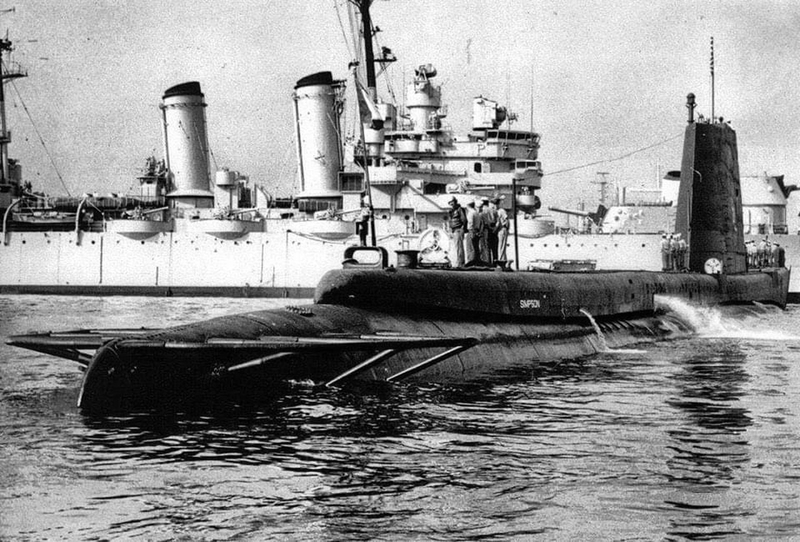 The Chilean crew reported on board later in the year for training and on 12 January 1962: Spot was loaned to that government under the Military Assistance Loan Program. She lies dockside with unidentified friends in front of her. Text courtesy of DANFS. 54k Robert Winthrop Simpson. Photo courtesy of wikipedia.org. 51k The ex-Spot (SS-413) as the Chilean submarine Simpson (SS-21). Photo courtesy of armada.cl. 193k A poster for the Japanese disaster movie Fukkatsu no hi (Virus) made in 1980. 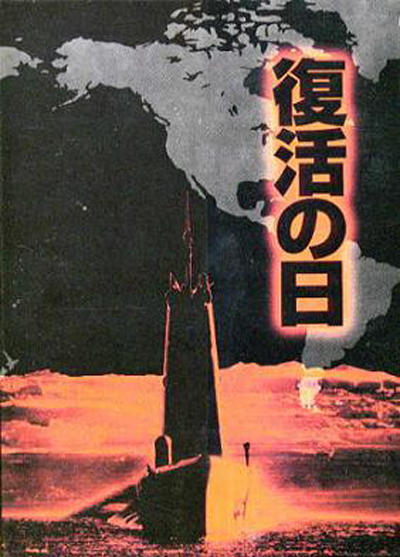 The poster shows the Chilean submarine Simpson (SS-21) which was extensively used by the director Kinji Fukasaku in the movie. Photo courtesy of Robert Hurst.